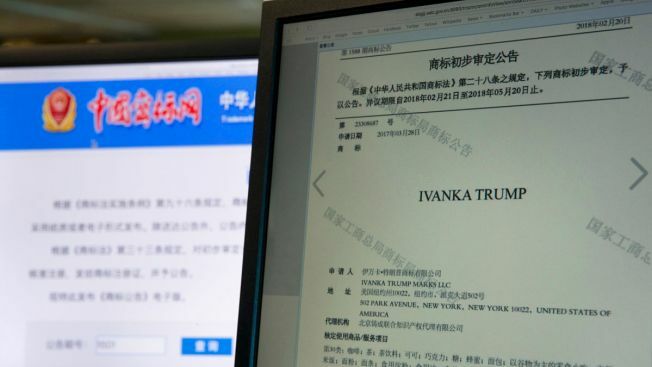 A computer screen displays an announcement on the Chinese Trademark Office website approving of the Ivanka Trump trademark to be used in wide variety of products from beverages to instant noodles and spices in Beijing, China, Monday, May 28, 2018. China has approved 13 Ivanka Trump trademarks in the last three months and granted provisional approval for eight more, raising fresh conflict-of-interest questions about the White House. Ivanka Trump's brand continues to win foreign trademarks in China and the Philippines, adding to questions about conflicts of interest at the White House, The Associated Press has found. On Sunday, China granted the first daughter's company final approval for its 13th trademark in the last three months, trademark office records show. Over the same period, the Chinese government has granted Ivanka Trump's company provisional approval for another eight trademarks, which can be finalized if no objections are raised during a three-month comment period. Taken together, the trademarks could allow her brand to market a lifetime's worth of products in China, from baby blankets to coffins, and a host of things in between, including perfume, makeup, bowls, mirrors, furniture, books, coffee, chocolate and honey. Ivanka Trump stepped back from management of her brand and placed its assets in a family-run trust, but she continues to profit from the business. "Ivanka Trump's refusal to divest from her business is especially troubling as the Ivanka brand continues to expand its business in foreign countries," Noah Bookbinder, executive director of Citizens for Responsibility and Ethics in Washington, said in an email Monday. "It raises significant questions about corruption, as it invites the possibility that she could be benefiting financially from her position and her father's presidency or that she could be influenced in her policy work by countries' treatment of her business." Trump spent the last full day of the Pyeongchang Winter Olympic Games games cheering Team USA in snowboarding, curling and speedskating. As Ivanka Trump and her father have built their global brands, largely through licensing deals, they have pursued trademarks in dozens of countries. Those global trademarks have drawn the attention of ethics lawyers because they are granted by foreign governments and can confer enormous value. Concerns about political influence have been especially sharp in China, where the courts and bureaucracy are designed to reflect the will of the ruling Communist Party. Chinese officials have emphasized that all trademark applications are handled in accordance with the law. "The brand has filed, updated, and rigorously protected its international trademarks over the past several years in the normal course of business, especially in regions where trademark infringement is rampant," Abigail Klem, president of Ivanka Trump's brand, said in an email. "We have recently seen a surge in trademark filings by unrelated third parties trying to capitalize on the name and it is our responsibility to diligently protect our trademark." More approvals are likely to come. Online records from China's trademark office indicate that Ivanka Trump's company last applied for trademarks — 17 of them — on March 28, 2017, the day before she took on a formal role at the White House. Those records on Monday showed at least 25 Ivanka Trump trademarks pending review, 36 active marks and eight with provisional approval. The World Intellectual Property Organization's brand database also shows that her company, Ivanka Trump Marks LLC, won three trademarks in the Philippines after her father took office. Two of them that cover clothing, including lingerie and baby clothes, were filed on Feb. 8, 2017, and registered in June and November. The third, filed on March 1, 2017, covers clothing and footwear and was registered in July. Companies register for trademarks for a variety of reasons. They can be a sign of corporate ambition, but in many countries, like China, where trademark squatting is rampant, companies also file defensively, to block copycats from grabbing legal rights to a brand's name. Trademarks are classified by category and may include items that a company does not intend to market. Some trademark lawyers also advise clients to register trademarks for merchandise that is manufactured in China, even if it's not sold there. 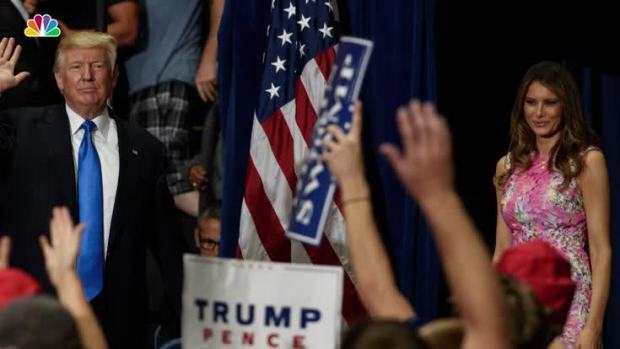 In a series of tweets on July 26, President Donald Trump said transgender people are no longer allowed in the military. In the past, Trump and his daughter, Ivanka, have promoted their support of the LGBT community. Ivanka Trump does not have a large retail presence in China, but customs records show that the bulk of her company's U.S. imports are shipped from China. The brand's secretive Chinese supply chains have been the subject of some controversy. A year ago Monday, three men working for China Labor Watch, a New York-based non-profit group, were arrested while investigating labor abuses at Ivanka Trump suppliers in China. After thirty days in detention, they were released on bail, but continue to live under police surveillance. Li Qiang, the group's founder, said Monday that he hopes bail will be lifted soon and that the case will not go to trial. Police in Ganzhou, the southeastern Chinese city where the men were detained, could not be reached for comment. The Chinese law firm that handles Ivanka Trump's intellectual property in China also did not immediately respond to requests for comment. Associated Press researcher Fu Ting contributed to this story from Shanghai.